Within months of getting into office, David Cameron started to see through his threat to privatise as much of the state as possible but, he never told anyone that this would entail actually selling-off our own sovereign security apparatus to foreign totalitarian regimes like the US. The BBC thought that this whole story was worth just one paragraph embedded in another story on its website with nothing published anywhere of any value and so as usual, its left to the Guardian newspaper and to organisations like ours to get this information from foreign news broadcasters - just to show you what our own country is up to. 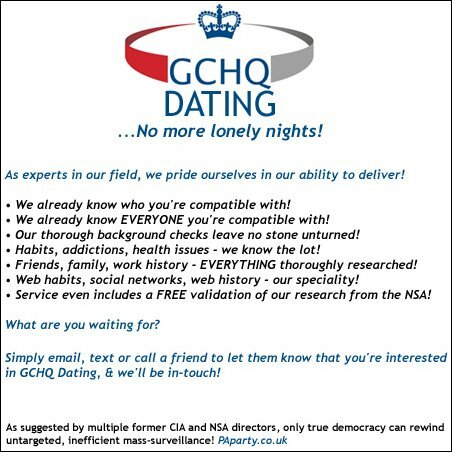 In a deal kept secret from the UK people, David Cameron has leased GCHQ to the US's NSA under a 3 year contract worth $150 M, so as to enable it to use GCHQ as its UK-based subordinate, spying on UK citizens who are suspected of nothing. Both David Cameron and GCHQ have willingly betrayed the UK people again and in doing so, not only do they both confirm that the UK is still America's b**** but, they also confirm that the UK no longer has any sovereignty. This effectively means that the UK also no longer has any leadership and so is not protected against the whims of desperate regimes but, as with everything else that happens to the UK people, it could not happen without the UK people choosing to let it happen. It's your choice and it always has been - you will always get what you vote for and so if you continue to vote for more 'representation', then continue to expect to have your rights abused.